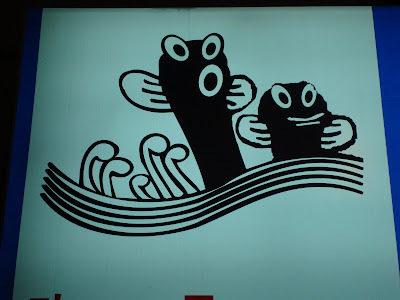 The following two tentacled fellows use their eyes to get your attention rather than draw attention to their lack of thumbs: The snooty way this squid is closing its eyes suggests its restaurant must be of the ritziest caliber where only the elite are welcome. This one's using his eyes to express complete happiness. Everybody's welcome at his place! This cuttlefish went all out in chef's gear. It's so tasty that it can't help but lick itself! I think this eel is conflicted about its job as a trade character. It looks like it just found out exactly what its restaurant does to eels. This pollack looks happy enough. If there is one thing that fish trade characters do well, it's jumping. That is their thumbs up.